Camera phones are smart devices that happen to have cameras. But don’t bother letting obsessive iPhone and Android photographers in on that. For many, their mobile phone is the camera they have in their pocket at all times — that just incidentally lets them make calls, check email and cruise the Web — well, almost. For those who consider their iPhone, HTC One or Samsung Galaxy a camera first, companies like Lensbaby offer a number of accessories — such as the new Creative Mobile Kit — that give the cameras’ lenses a whole different perspective. I checked out the brand new LM-20 and LM-30 lenses, which come with a plastic mount and kickstand and a handy set of protective lens caps. The LM-20 is designed to give you a “sweet spot” of intense focus surrounded by gradually increasing blur, while LM-30 takes a sharp centered image surrounded by a circle of reflections. I found the bracket rather clunky and awkward to attach and remove at first, but came to appreciate that its moving parts kept it tightly attached to the phone, alongside a magnetic lens attachment that easily lets you swap out lenses at will. While the mount sits securely, the lenses can drop off if they run into obstacles. Luckily the outer casing was thick enough to protect the glass if it falls to the ground. Note too that different mounting kits are available depending on which brand and model of iPhone or Android phone you have. I used the plastic bracket mount that fits the iPhone 5 and above. Mounting aside, the actual lenses are pretty amazing. Lensbaby got into the smartphone business last year, after spending the previous 10 years making specialty lenses for DSLRs and mirrorless cameras, so its no surprise that it absolutely has the tech down. There’s a kickstand included in the kit, but sadly, you cannot use it with the lenses, but rather as a related extra that you can use for steadying the camera for other kinds of shots or for FaceTime and Skype calls with the front-facing camera. The kickstand slides into the bracket and is secured to the mount via magnets; it can be rotated for different viewing angles, but is best used with the device in landscape. It is worth pointing out that the kickstand mounts over the camera, so you cannot use the kickstand and the creative lenses at the same time. Lensbaby’s LM-20 is a more conservative lens that can give you a more or less normal perspective on the proceedings, if you choose, but what fun is that? The focus sweet spot is made to have fun and produces some gorgeous effects. Depending on how you zoom, very little may wind up in perfect focus, but for me that was not really the point. The LM-30 gives that psychedelic look to your photos that you no-doubt could also achieve with certain software filters. But for me, the experience of actually seeing the effect in real time was key. 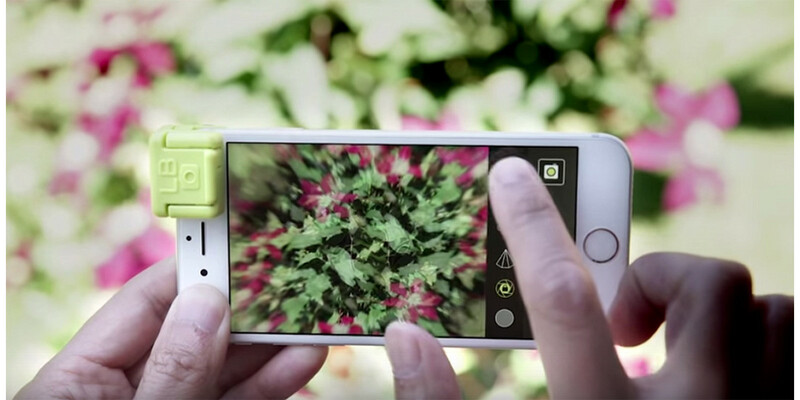 The Lensbaby lenses are designed to be used with the LB Mobile app for iOS and Android. The iOS app lets you move your desired focus spot around the frame. It also includes white balance and exposure locks, a toggle Rule of Thirds grid, square crop, a still image and video mode, right-side up and upside-down toggle, a sharpening slider and more. The Android app, for version 4.1 and above, has much the same functionality, adding filters for warm/contrast, monochrome and sepia. I started off using the iPhone’s default camera app, and that also worked fine for most of what I needed to shoot, but without the specialized adjustments that the LB mobile app offers. I’d recommend using the app for maximum flexibility. It requires iOS 8 or later and is optimized for use on the iPhone 5, 5s, 5c, 6 and 6 Plus. As a photo enthusiast, I tend to be pretty hard-line at documenting and capturing “reality” and hopefully putting at least something of a profound spin on why a subject is interesting. That’s one reason I generally eschew gimmicky filters and special effects lenses. However in using this Lensbaby set for awhile, I’ve softened on that point somewhat, partly because they are so much fun, so unpredictable and produced surprisingly beautiful images. LM-30 in particular was the stuff of dreams. Now, I can’t wait to go back to some of the places I’ve shot with my DSLR and recapture them using these lenses — which so easily fit into my pocket. The Creative Mobile Kit is reasonably priced for for the high-quality lenses it offers, but as a novelty item, it’s no cheap thrill: It will set you back $89.95. On the other hand, you may wind up using them more often than you expected.